Stan Searle -- In 1988 Dickinson Cattle Co staged the first Texas Longhorn drive right down the middle of Colorado Springs - dead center on Tejon Street. The plan was to start up near Colorado College and end right at the El Paso County Court House south of the main business area. DCCI had nearly 100 cattle and we ask Stan Searle to bring some of his big steers to decorate the event. This had not happened since Charles Goodnight drove Longhorns northward bypassing Colorado Springs to the east side in 1880. It was the idea of the city fathers to stage a very western event to promote the Pikes Peak or Bust Rodeo which was to happen the following week. The rodeo was nearly 100 years old and the press was getting tired of trying to find something new and different to feature. There were about 50 mounted cowboys, cowgirls and want-to-be drovers. Randy Witte, Publisher of the Western Horseman Magazine was there with his daughter who was Queen of the West for the rodeo. City motorcycle cops were lined up to shut off cross traffic and make the drive clear sailing, non totally sure what wreck could happen. 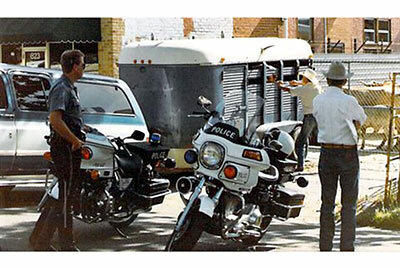 We were all assuring the city authorities the cattle were gentle and nothing would go wrong. They would not jump through a plate glass store window. It was me, Gary Lake, Mikey Lacy, Za Johnson, Kirk Hanna, Betty Watt, my dad Frank, and other volunteers putting the plan together. We were hauling the cattle with trailers from the different ranches. Prior to the drive the city folk suspected a costly stampede, trampled tourist on the side walk, or old fashioned shish kabob horns puncturing right through some unsuspecting senior citizen -- perhaps one citizen on each horn as they left town. Stan Searle, always the positive one was assuring the city folk "that Texas Longhorns were gentle and virtually helpless due to the long length of their horns. The horns were so long they did not have the leverage to puncture, lift or gore someone. It was totally safe due to the length factor." As Stan was explaining how the steers could not do these dastardly things, he was facing west talking to me, the townsmen, Mikey Lacy and a huddle of mostly non-longhorn people. Stan was totally convincing until, unknown by Stan, those of us listening and watching the commotion behind Stan saw something quite different. His big steers started fighting in the trailer and horns were tearing through the roof of his trailer like it was paper. Stan just kept going with his soothing assurance as one horn protruded about 30" in the air out the top of his trailer. Finally, well into serious dialog, Stan noticed everyone looking behind him and not listening to him. He turned and saw it! Stan grabbed a stick and started poking the steers in the nose. I ran and got a camera and took this last shot just before the steer retracted most of the horn length. I wish I could have gotten the shot when the whole horn was blasted through. So ended Stan's story of safety and assurance. However, the drive went without flaw and Stan was in fact completely correct in the end.